Back in the felting saddle at last and new companion blog Clasheen Uncut! I had just written a long post about my first felting workshop o f 2010 and aggh, the internet connection went while I was uploading the data and for some obscure reason the whole post was lost bar the tags. Forgive this extremely short and abbrigged version but I am terrified that the link will go again and just want to update you on Saturdays return to the felting saddle!!! On Saturday printmaker and papermaker Sylvia joined me in the morning for her first felting experience. Luckily the water was back in time although since I’ve been on the computer this morning my immersion has given up the ghost, loads of loud electricial noises and now the wretched thing appears to have stopped functioning. Thankfully the kitchen range keeps the downstairs of the house realtively warm while the central heating is not working so once Sylvia had selected her wool this is where we decided to lay out her vessel. She used a combination of apple green, teal and white Icelandic wool with some blue mulberry silk, white cotton gauze and white tencel tops (at least I think that they are tencel!) for surface decoration. 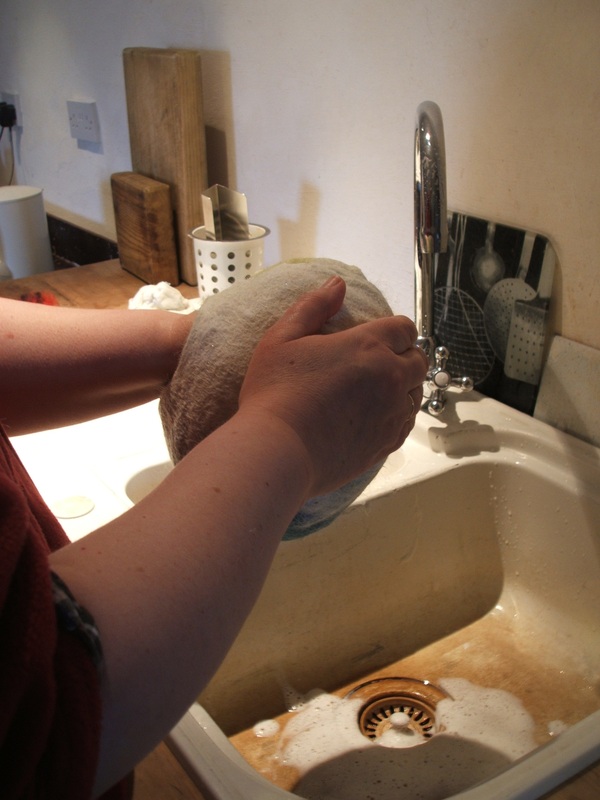 If any of you would like to have a go felting with the Icelandic wool it is GREAT for vessels. I am offering simple felting kits and wool for sale through my Etsy shop, just let me know if there is any special colour that you require. 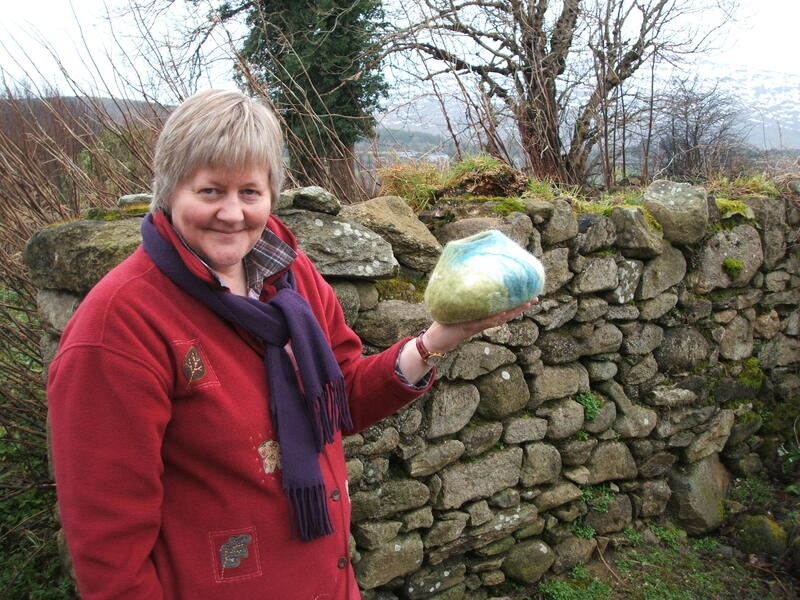 I am sure that you will all agree Sylvia’s finished vessel is amazing, what a great first felting project. Before the internet connection gives up the ghost I just want to announce my new blog Clasheen Uncut! This is the place where I will ramble about all my non felting projects so why not pop over and have a look if you can spare the time. This entry was posted in Felt, workshops and tagged batts, Clasheen Uncut, Etsy, Felt, felt bowl, felt vessel, felt workshops, Felting, felting workshop, fibre, Icelandic wool Icelandic batts, mulberry silk, silk, tencel, weaving, wet felt, wet felting, wool, wool batts by Nicola. Bookmark the permalink. Just returned from Clasheen Uncut…Great first post. Yahoo…More of you with my morning coffee…Life is good.